One day last summer , Renford Reese went to pick up his care at a repair shop in South-Central Los Angeles. He asked the Mechanic, an elderly Korean man, if he'd fixed the muffler. Had he fixed the transmission? The next thing Reese said brought tears to the man's eyes. "I looked him in the eye put my hand out and said 'comop sin, me dah,' which is 'thank you' in Korean," said Reese. "First the, mans mouth dropped, and then his eyes watered. He had never heard an American, let alone an African American, attempt to speak his language." To Reese, a doctoral student in the School of Public Administration, this interaction illustrates the power of language. "Being able to say a few word in someone else's language is a powerful tool," said Reese. "It is a tool that I strongly believe can be use to help break down racial mistrust." In an attempt to help break down the barriers among members of Los Angeles' ethnic communities, Reese earlier this year launched the "Colorful Flags" program. Targeted at schools and public-service organizations - including police departments - the program aims to overcome ethnocentric behavior and racial mistrust by teaching five basic common courtesy statements in any particular area's five most predominant languages. "Colorful Flags" has proved to be a remarkable success. . It already has been adopted by seven schools in the Montebello and Los Angeles school districts, More than 2,500 first-, second-, third- and fourth-grade students in those schools spend approximately five minutes each day learning courtesy statements in the five most spoken languages in their area, including Spanish, Armenian, Korean, Cantonese, Filipino, Vietnamese and Russian. '"Colorful Flags' is not just a language program," Reese said. "This is program that can be used to open up dialogue between people and stimulate curiosity about a person and his or her culture. "Today, diversity is said to be valued, But what is diversity if an individual cannot even cordially say 'hello' to someone in that person's language?" Last November, when Foreign Service director-general Genta Holmes was visiting the University Park Campus, she sought out Reeves to discuss the idea. "Colorful Flags" is part of Reese's work as a President Steven B. Sample Fellow at the Leadership Institute. A requirement of the one-year fellowship is that the recipient design and lead a practical project in the Los Angeles community. Next month, Reese will donate 2,000 instructional audio tapes (worth $20,000) to the Los Angeles Police Department. The tapes contain the five statements in the 10 most common languages spoken in the region. As well as serving as a phonetic guide, the tape includes background information on the various countries and their cultures. "I feel that the 'Colorful Flags' concept is perfect considering police departments across the country are placing an emphasis on community-based policing," Reese said. "If the officers were able to say a few courtesy statements in another person's language, this should show members of that community that someone cares about them and about their culture." In addition, officials from the Metropolitan Transportation Authority have met with Reese to discuss a donation of 2,000 tapes to help teach courtesy statements to the MTA's force of 1,800 bus drivers and 250 security officers. Along with the tapes, Reese plans to provide laminated business card-sized phonetic guides, which drivers and security officers can carry for quick reference. Reese said he plans to keep the program as simple as possible - not only for the students learning the courtesy statements but also for the teachers. In the schools, it's the homeroom teachers who lead the program. To make their task as easy as possible, Reese has put together a comprehensive package that gives background information on the different cultures and a re-source list for additional materials. the students learn a "statement of the month." If, for example, "hello, how are you you doing!" is the statement, it will be taught all month long in the area's five most spoken languages. The idea, called "brilliantly simple" by Reese's faculty advisors at the Leadership Institute, to him shortly after he had about Latasha Harlins, the African-American youth who was shot to death in March 1991 by a Korean merchant after a dispute bottle of fruit juice. I was extremely frustrated that event," said Reese, a native of Atlanta who at the time was in Seattle. "Out of my frustration, I came up with an idea thought could help bridge gaps. Language is at the core of who we are as individuals, and I realized that if I spoke someone else's language, even one phrase, I reach out to that person." The Sample Fellowship gave Reese an opportunity to put his plan to work. After talking the idea through with his advisors and classmates he knew he was onto a winner. He wrote a proposal to the Arco Foundation, which funded the program start-up with $12,500. Reese then went about convincing school districts to adopt "Colorful Flags." After having various doors shut in his face, Reese managed to convince Darlene Robles, superintendent of the Montebello School District, last September. Robles sent out a memo to her elementary school principals explaining the program. In the end, 64 teachers from six schools in the Montebello district and one in the L.A. Unified School District - the 32nd Street/USC Magnet School - volunteered to teach Reese's program. 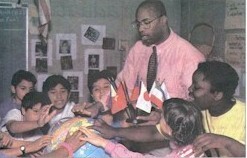 The program began the second week of January. Although he must monitor the program for effectiveness, Reese said, he gives the teachers as much space as they need, visiting each classroom that participates in the program about every five weeks. So far, he has been ecstatic with the results. "A lot of teachers have told me that if they miss a day teaching a phrase, the kids are all over them," he said. "Every time I go into a classroom I see that excitement in the kids." The program also bolsters the self-esteem of students from the various ethnic groups. For example, Reese said, children can assist their teachers when it is time to learn a greeting in their languages. "I remember going to one class where the students were learning a phrase in Armenian. I called on one student who was Armenian and asked him to help me teach the class. You should have seen the look on that kid's face because I was paying attention to his language and to his culture. "It really empowered him and gave him confidence, and it let me know I was on the right track."